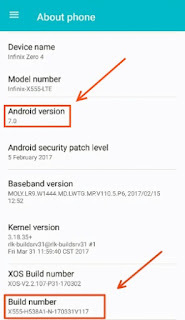 Hello guys, recall InfinixMobility earlier released the official list of Infinix Smartphones that will receive Android Nougat 7.0 Update and subsequently rolled it out to the Infinix Note 3, well that same update is now being pushed to the Infinix Zero 4 in batches. 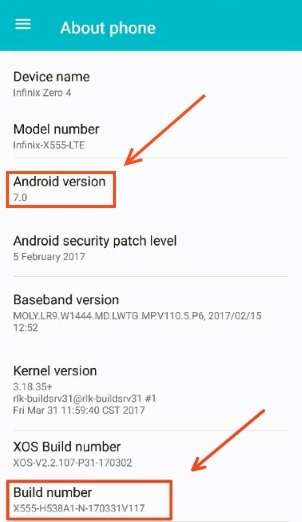 Android 7.0 Nougat update for the Infinix Zero 4 has build number X55-H538A1-N-170331V117 and quite an enormous size. In this tutorial, we will discuss the two possible methods and you can choose anyone you preferred to update your Infinix Zero 4 to the latest version Android 7.0 Nougat. The first method is OTA (over-the-air) and the second method is T-Card (putting the raw files on SD card). If you have already rooted your Infinix Zero 4, to be on a safer side, you're strongly advised to Unroot. Upgrading an already rooted device Over-the-Air can get the device bricked. Also, Make sure your device is at least 80% charged before proceeding. Ensure you have enough data bundle or download over unlimited Wi-Fi. Never forget to back up your files, contact and essential apps before you begin, because the flashing process will re-brand your smartphone and thus clear all your important data and files. Once the above requirements are met, go ahead with the below procedures. Go to your phone "settings"
Scroll down to "about phone"
Click on it and tap "system update"
Relax and wait for the new update to fully install. After successful installation, your phone will be rebooted and Android 7.0 Nougat will smile to you on the device! Take note that the first booting process might take a few minutes to complete. NB: After updating, if you encounter any boot loops, simply clear the system cache by entering the quick boot menu and the issue will be solved. If you don't have a good network to update your device via OTA or if you followed the above steps, and you cannot get the update Notification, simply update your phone via T-Card with the instruction below. 5. Zip all of the files in the folder to a new zip folder. If you encounter any boot loops Just clear the system cache by entering the quick boot menu.